Nokia's first entry into the gaming market goes under the Modojo microscope as we give you the 411 on what it's all about! For years, the group at Nokia has specialized in making top-of-the-line cellular phone technology to give the user an abundant amount of options when it came to communications. They had become one of the higher companies to do so, becoming quite successful in terms of product variety and service. 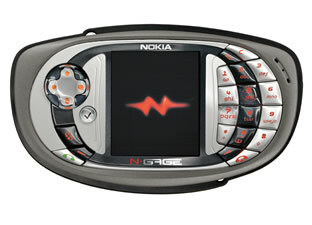 With the N-Gage release in 2003, they decided to delve into the video game market. Also, owing to consumer feedback, they launched the N-Gage QD in 2004, boasting a smaller, slicker design and updated technology. Nokia has also started creating original content for the N-Gage QD, recently releasing Pathway to Glory and an updated version of the classic game Snakes. The next games in their line-up will include Rifts, based on the popular card-game legacy of the same name, and the mysterious racing game Glimmerati. Who is the N-Gage for? Some people might be turned off by the fact that the N-Gage was muddled with some low-quality games during its initial launch. However, the attention to detail has since grown, and some of the more recent efforts, like Pathway To Glory and EA's SSX: Out of Bounds, has gotten better. Another thing to consider are the N-Gage's other uses, as a cell phone, an email receiver (and provider), and an MP3 player. These multiple functions might appeal to the casual player, as well as those looking for more than just a game machine. The N-Gage QD sells for $199.99 with Tony Hawk's Pro Skater included as a pack-in, but if you sign on a deal with particular phone providers, they can give you a rebate that gives you the system for practically nothing. A contract is involved, but, hey, free is free. Tony Hawk's Pro Skater (Activision) - Activision's long-running franchise featuring the ultimately popular skateboarder brings all the action and thrills that it's known for, as well as a couple of nice touches that N-Gage players will appreciate. First and foremost, the game is in 3-D, recapturing the essence and feel of the sport of skateboarding and allowing you better depth in performing tricks and finding items. Secondly, you can challenge a friend in two-player ghost play to see who's the better boarder. Finally, the controls are easy to get into, yet difficult to master. You'll be grinding and performing combos in no time. But...can you handle the 900? Pro Skater is a most definite pick. Colin McRae Rally 2005 (Nokia) - Codemasters' dirt-kicking rally racing series has always made strides over the years to become the definitive racing experience, and on consoles it's really made an impact. But what about the handheld market? Well, not to worry, as the game has made the transition to the N-Gage without breaking a dirt-filled sweat. Colin McRae Rally 2005 brings forth a slew of licensed vehicles to take control of, as well as real-time damage that must be maintained to keep the performance of your vehicle up and running so you don't fall behind on lap times. Throw in a variety of modes to complete and great controls and you have a game you won't mind getting in the spin with. WWE Aftershock (THQ) - The wrestlers of the WWE are ready to put you in a headlock for your N-Gage. Take control of such popular WWE superstars as "The Legend Killer" Randy Orton, Jon Cena, The Undertaker, and more through a number of different modes. Make a conquest for the WWE belt or challenge a friend and take them on in competition via the Bluetooth network. There's plenty of moves to learn and use to your advantage, including finishing maneuvers for each character. The graphics promise to be absolutely killer, capturing the attention of a WWE broadcast and bringing you all the excitement. This looks to be a big body slam of fun. SSX: Out of Bounds (EA Sports Big) - For years, the SSX downhill snowboarding series has captivated audiences on video game consoles. So why shouldn't the N-Gage get a turn? SSX: Out of Bounds brings the thrills and spills of the series to handheld form, and the game has held up rather well in the translation. Bright 3-D graphics bring the terrains to snowy life, and the controls feel just right, allowing you to pull off tricks and uber tricks in your quest to be king (or queen) of the mountain. Race a friend in multiplayer mode or challenge them to a ghost race in the N-Gage Arena, and don't forget about the downloadable content either- new characters, outfits, and boards can easily be acquired. Sometimes it's good to go out of bounds, as SSX proves. Pathway To Glory (Nokia) - When the N-Gage originally launched last year, one of the things that was severely lacking was originality in terms of game play. Fortunately, Nokia's made a few strides since then to get this resolved, and one of those strides is Pathway To Glory. In this real-time strategy game, you take control of a multi national unit of soldiers as they take on different armies and enemies in their conquest of Europe during the World War II era. There's lots of tactics to master, and the game moves pretty fast as well. Throw in two player challenges via the N-Gage Arena and you have a game that proves war may be hell, but it's an enthralling experience.